Those who know me know that I want nothing more than for the Green Party to succeed, but this objective is imperilled if the voting public does not think of the Greens as real contenders. With all due respect to Jane Sterk and the aura of civility she seeks to instill, voters can speak for themselves, thank you very much. It is not Clark who won last month’s provincial election, but her party — or more specifically, most of her party’s nominees. There is no inherent sense in which the decidedly un-green Premier “deserves” a seat. Just like any other candidate, she must convince the people of a local community that she is the best politician to represent them. That is how Canadian parliamentary democracy works. If Sterk believes that we should switch to some kind of presidential or semi-presidential model in which we elect our leader directly in a province-wide vote (not entirely a bad idea), then she is welcome to put the suggestion up for public debate. But otherwise, it just looks like the Green Party, despite its historic and well-deserved breakthrough in May’s election, is falling back into old habits and virtually dropping off the political map outside the writ period. 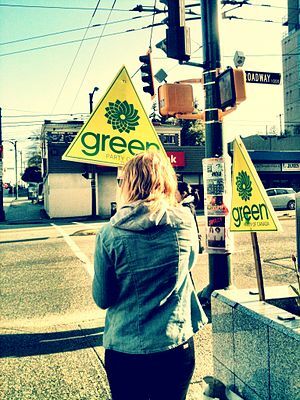 When the Greens do not bother to run in byelections, they are not taken seriously and neither are their ideas. It is one thing to refrain from fielding a candidate as part of a principled campaign for electoral cooperation, as the federal Greens recently did (although I had some qualms about that being a unilateral act without any other parties on board), but it is something else entirely to stand aside on the grounds that a Premier has a right to a seat simply by virtue of being Premier, regardless of her ability to win a fair fight at the riding level. The only real way to go about “respecting the wishes of the voters” is to give them a broad range of electoral options and allow them to choose freely amongst them. To do otherwise does not put the Green Party above the fray. Frankly, it just makes them pushovers. This entry was posted in BC Politics, Democracy and tagged Christy Clark, Green Party, Jane Sterk by David Taub Bancroft. Bookmark the permalink.